All materials displayed or otherwise accessible on this website, including, without limitation, news articles, written content, paintings, photographs, and images, are protected under Canadian and foreign copyright or other laws, and are owned by the artist the party accredited as the provider of the content (i.e. all copyrights, trademarks, service marks, and logo's are the respective property of their holders). In addition, this website is protected under copyright law as a collective work and/or compilation pursuant to Canadian and foreign laws. No part of this website may be copied without written consent from the Bayfield Archives & Historical Society. If you detect any issues with the legality of this site in any way, shape, or form, problems are always unintentional and will be corrected with notification. In such a case, please submit your concerns using the Bayfield Archives e-mail link. LIABILITY NOTICE YOU AGREE TO DEFEND, INDEMNIFY AND Bayfield Archives & Historical Society - BAHS, IT'S WEBMASTER AND WEBHOSTING PROVIDER HARMLESS FROM AND AGAINST ANY AND ALL CLAIMS, LOSSES, LIABILITY COSTS AND EXPENSES (INCLUDING BUT NOT LIMITED TO ATTORNEY'S FEES) ARISING FROM YOUR USE OF OUR WEBSITE, AND/OR VIOLATION OF THIS AGREEMENT AND/OR YOUR VIOLATION OF ANY THIRD-PARTY'S RIGHTS, INCLUDING BUT NOT LIMITED TO INFRINGEMENT OF ANY COPYRIGHT, VIOLATION OF ANY PROPRIETARY RIGHT AND INVASION OF ANY PRIVACY RIGHTS. THIS OBLIGATION SHALL SURVIVE ANY TERMINATION OF THIS AGREEMENT. To help you better understand 'Cookies', here's a brief description and an example use. Cookies are generally used to make it more convenient for users to move around websites. A cookie is a piece of data stored on the user's hard drive containing information about the user, which isn't necessarily linked to any personally identifiable information. For instance, if you choose, cookies may be used to 'remember' details like your password and keep you logged into certain website enhancements like calendars, and forums. These types of cookies are encrypted to make the information in the cookies unreadable to anyone except the organization (website) with which you are dealing. Once you close your web browser, the cookie simply terminates. When you visit web pages on this website, a cookie is created that logs your IP address. We use IP addresses to analyze trends, administer the website, track user's movement to determine visitors favorite pages and/or articles, and gather broad demographic information for aggregate use. IP addresses are not linked to personally identifiable information. The information we collect is used to improve the content and service provided by our website. We use non-identifying and aggregate information to better design our website and to share with our partners, members and sponsors. For example, we may tell a sponsor that X number of individuals visited a certain area on our website, or that Y number of men and Z number of women answered our online poll, which was designed to give feedback on a local event or show. The Bayfield Archives & Historical Society and this website will not disclose anything that could be used to identify those individuals. This website contains links to other sites. Please be aware that BAHS is not responsible for the privacy practices of such other sites. We encourage our users to be aware when they leave our site, and to read the privacy statements of each and every website that collects personally identifiable information. This privacy statement applies solely to information collected by this website. Bayfield Archives & Historical Society does not claim ownership of any materials you provide to use on our website, including, without limitation, any written and/or published content, photographs, images and any information gathered from visitors via user polls and questionnaires. However, by posting, uploading, providing or submitting your personal material ("Submission") you are granting www.bayfieldhistorical.ca permission to use your material in connection with the operation of our website, including, without limitation, the license rights to: publicly display, distribute, transmit, translate, edit, resize or reformat your Submission, and the right to publish your name in connection with your Submission. Also, no monetary compensation will be paid with respect to the use of your Submission. In other regards BAHS is under no obligation to post or use any Submission you may provide, and may remove any personal Submission at any time in her sole discretion. In addition to the warranty and representation set forth above, by posting or uploading a Submission that contain images, or photographs, you warrant that you are the copyright owner, and posses the appropriate rights to grant the website located at www.bayfieldhistorical.ca permission for their public display and use. This website located at www.bayfieldhistorical.ca may contain links to other sites, which are created and maintained by other public and/or private sector organizations. We provide these links solely for your information and convenience. When you follow a link to an outside website, you are leaving this website and our information management policies no longer apply. Also, the linking to or from this website does not imply on the part of BAHS any endorsement or guarantee of any of the individual organizations or information found on their respective websites. In addition, BAHS does not assume and is not responsible for any liability whatsoever for the linking of any of these external websites, the operation or content of any linked websites, nor for any of the information, interpretation, comments or opinions expressed in any of the linked websites. 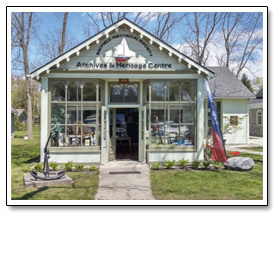 This website www.bayfieldhistorical.ca which is owned by the Bayfield Archives & Historical Society, strives to provide you with the most accurate and up-to-date content, product and service information available. However, we are not responsible for typographical errors or technical inaccuracies on our website. If you believe you've found an error, please submit such feedback using the following the Bayfield Archives e-mail link.